We offer drains in plated & PVD finishes that complement our sink finishes (Oil Rubbed Bronze, Antique Copper and Polished Copper). PVD finishes have a lifetime warranty and wil never chip or peel. The finish of the faucet may also be a consideration when selecting your drain finish. If you would like assistance in selecting a drain and faucet for your sink please call us at 877.340.0800. 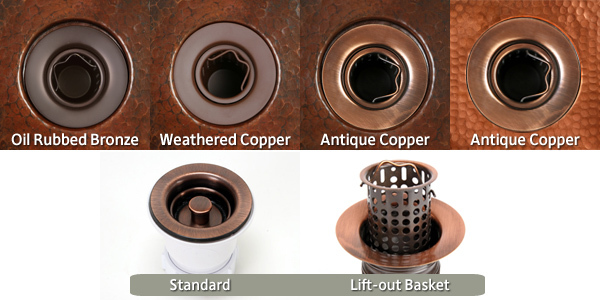 The Hexagon Copper Bar Sink features a flat rim suitable for drop-in or undermount installation. This sink is hand-hammered in 16 gauge, lead-free copper by 3rd generation coppersmiths. We are happy to create a custom order for you. If you're interested in adjusting the dimensions or making other modifications please feel free to call us Monday – Friday, 7am< – 4pm PST at 360.321.2131.